Product information "POPP Flow Stop gas/water shut-off controller"
Overflowing bathtubs, leaking washing machines or defects to gas and water pipelines – damages can occur almost anywhere and cause immense costs. The POPP Flow Stop can prevent this – thanks to Z-Wave. 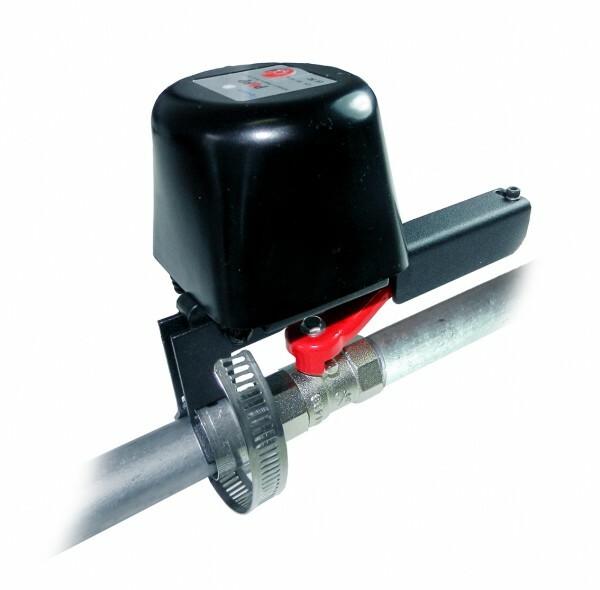 Flow Stop is a motor operated shut-off controller for automatic flow stop of gas and water pipes. It is equipped with Z-Wave technology. This means it is particularly suitable for use in smart homes. Even installation is child’s play. The POPP Flow Stop is delivered completely including valve control/motor, power supply, mounting and Quick Start Guide. It is easy to assembly on an existing ball stop valve. In doing so, all usual pipe standards, including ½" and ¾“, are possible. On this occasion, no pipes must be dismantled or even water must be drained. That way the installation is normally done in 5-10 minutes. As of now, you can turn off the water also from outside via mobile device – or automatically, e.g. if a water sensor detects a leaking pipeline. It doesn’t matter if you install the Flow Stop on your washing machine’s water conduit or use it for garden irrigation – the POPP Flow Stop will make your home safer and more comfortable. Only the POPP Flow Stop supports the Security Command Class and owns security features, which are not supported by comparable devices. Communication to the Flow Stop is secured with encryption. This does not only protect the device against burglars that want to do harm to the home (e.g. waste water by opening the valve to watering system). It’s also protecting better against jamming of the communication link. Unsolicited report of any state change of the Flow Stop to the controller. Second communication channel to report manual operation of the device. Here up to 5 other devices can be operated independent of the controller. The remote operation of the device can be limited to ‘only open’, ‘only close’ or ‘no remote control’ to protect against malfunction. Related links to "POPP Flow Stop gas/water shut-off controller"
POPE011801 2.1.1 1.0 partly compatible associations via gateway: valve reopens again after flood alarm switched off Scene via App „Device Association“ or „If-Then“ or „Logical Rule“ not working. ZMEERAZ 2.1.1 1.0 partly compatible associations via gateway: valve reopens again after flood alarm switched off Scene via App „Device Association“ or „If-Then“ or „Logical Rule“ not working. ZMEEUZBWAY 2.1.1 1.0 partly compatible associations via gateway: valve reopens again after flood alarm switched off Scene via App „Device Association“ or „If-Then“ or „Logical Rule“ not working. ZMEEUZBWD 2.1.1 1.0 partly compatible associations via gateway: valve reopens again after flood alarm switched off Scene via App „Device Association“ or „If-Then“ or „Logical Rule“ not working. ZMEERAZ2 2.1.1 1.0 partly compatible associations via gateway: valve reopens again after flood alarm switched off Scene via App „Device Association“ or „If-Then“ or „Logical Rule“ not working. ZMEEUZB1 2.1.1 1.0 partly compatible associations via gateway: valve reopens again after flood alarm switched off Scene via App „Device Association“ or „If-Then“ or „Logical Rule“ not working.